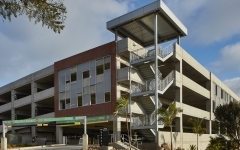 The parking structure at Palomar College brings increased parking capacity for an expanding campus and growing student population. 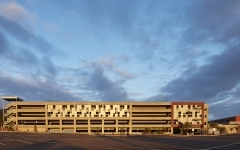 The five-level, 1,615-space structure incorporates several high-tech features, including a parking count system, license plate readers and security cameras. Sustainable amenities were integrated throughout the garage, including a roof-level drainage system that directs storm water to bioretention areas on-site, provisions for a rooftop photovoltaic system, and high efficiency LED lighting. Enhanced safety features include clear sightlines throughout the interior, open stairways, glass-backed elevators, and increased lighting levels. Entry and exits are provided on three different levels with an internal double-helix ramping system for efficient vehicle circulation. Façade elements at vehicle entrances consist of brick veneer and decorative metal screening, while elevator towers are designed with brick and aluminum panel veneer. 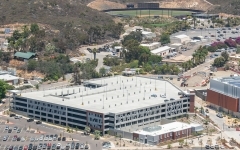 A campus police facility adjacent to the garage includes a lobby area, conference training rooms, locker room facilities, and emergency control center, and houses the mechanical and electrical systems of the building. 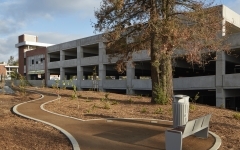 The parking structure includes ground-level storage rooms utilized by campus police.